Understanding ankle anatomy and the structures that are most commonly injured will help you prevent and treat common ankle sprains and injuries. Did you know that ankle injuries are the single most common injury suffered during sports participation? We often overlook ankle injuries, chalking them up to just being part of the game. A good understanding of the anatomy and structures that can be injured can help you learn how to treat your ankle injury and prevent future ankle injuries. The ankle joint is made up of 3 bones that articulate (touch) with each other. The tibia, fibula, and talus. The tibia is the weight bearing bone of the lower leg...also known as the "shin bone". The fibula is the smaller low leg bone, on the outside of your leg. Both the tibia and fibula extend down to the ankle, and their ends create the "ankle bones" on the inside and outside of the ankle, called the malleoli. The talus sits between the tibia and the fibula, and creates the ankle "mortise". This joint acts like a hinge joint, allowing you to move your foot up and down. 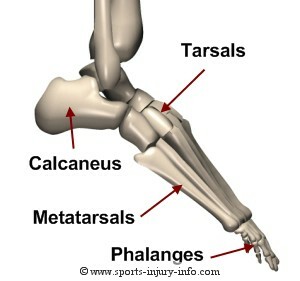 Other bones important in ankle anatomy include the calcaneus (heel bone), the tarsals, metatarsals, and phalanges (toes). Moving further down the foot are the tarsals - five bones that form the mid-section of your foot. Each of these bones is connected to each other with small ligaments. The tarsals make up the midfoot, and part of the arch of the foot. There is not a lot of movement between these bones, however, they do need to be able to give and take as you bear weight on the leg. Following the foot towards the toes, next comes the metatarsals, five bones that make up the end of your foot, just before the toes. This is referred to as the forefoot. The metatarsals are the most commonly injured bones in the ankle. Most fractures and stress fractures occur here. Last, but not least, the final bones are the phalanges - better known as the toes. Each toe is made up of three bones, except for the big toe, which only has two. Toes are commonly injured in sports, however, these injuries are usually minor. Ligaments are commonly sprained at the ankle, with ankle sprains being the most common sports injury. There are several ligaments of importance in the ankle. The medial side of the ankle is comprised of one large ligament that spans the entire end of the tibia. This ligament runs between the tibia and the navicular and calcaneus. 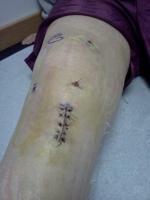 It has several areas of thickening, or bands, but is considered one ligament. You may have heard sports announcers talk about a "high ankle sprain". 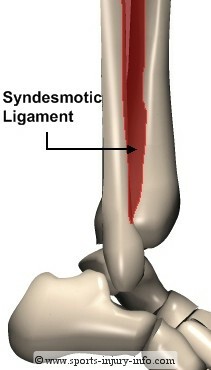 This type of injury involves the sydesmotic ligament, which runs between the tibia and the fibula above the ankle joint. 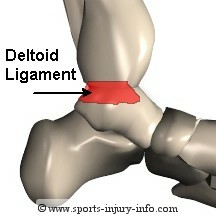 Injury of this ligament is not common. 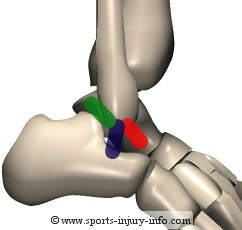 This ligament is sprained when the fibula and the tibia are seperated or pushed apart. It can occur with forced dorsiflexion of the ankle, or with with a very forceful landing. Foot ligaments include all of the ligaments that connect the tarsal bones, as well as the ligaments and joint capsules of the metatarsals and phalanges. Ligaments are responsible for maintaining the arch of the foot, especially at the tarsal bones in the midfoot. The plantar fascia is not a ligament, but does help to maintain the arch, and may become inflammed with plantar fasciitis. Muscles that originate (or start) at the low leg insert (or attach) to the bones in the ankle and foot and help produce motion at the ankle and foot. Muscles also help to provide stability during activities. The calf muscles, the gastroc and soleus, allow for pointing of the foot, as well as lifting up on your "tip-toes". 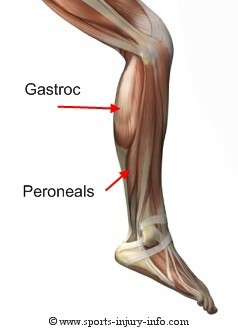 The peroneal muscles (also called fibularis muscles), on the outside of your leg, help to keep you stable during activity, and also help turn the foot out (called eversion). Other smaller muscles on the front and inside of the leg help to flex and extend your foot and toes. 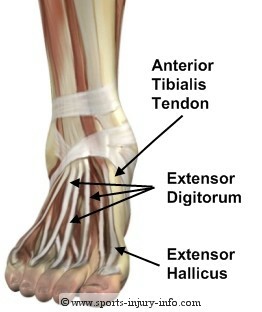 These include the anterior tibialis, posterior tibialis, and flexor digitorum, extensor and flexor hallicus, and extensor digitorum longus and brevis. The majority of the foot muscles are small, intrinsic muscles that run along the underside of the foot. They help to move the toes, and to maintain the arch of the foot. Most of the muscles in the foot that are injured with sports originate from the lower leg and cross the ankle. 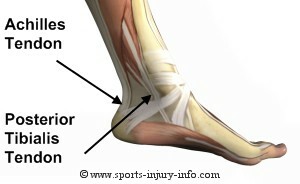 Tendons are also a common site for sports injury. All of the muscles of the lower leg attach to the ankle and foot through tendons. A common injury that occurs due to tissue overstress is tendonitis. The medial side of the ankle is home to several different tendons. The most commonly injured of these is the posterior tibialis tendon. It runs behind the medial malleolus (ankle bone) and attaches at the mid-foot. The lateral ankle tendons include the peroneals, or fibularis tendons. 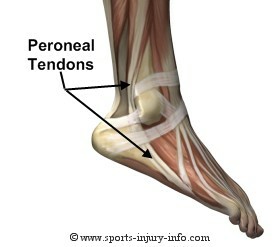 There are three peroneal tendons, and they all run along the outside of the ankle behind the lateral malleolus. They attach at the base of the 5th metatarsal, and also on the bottom of the foot. The tendon that runs down the front of the leg and attaches to the midfoot tarsal bones is the anterior tibialis. It helps to pull the foot towards the body, and to control motion during activity. This is often the muscle and tendon that is irritated with shin splints. All of the muscles, bones, and ligaments work together to keep your ankle and foot in tip top shape. Understanding ankle anatomy is the first key to prevention and treatment of ankle injuries. You can learn more about ankle anatomy with our Ankle Video Tour. I'll walk you through all of the ankle anatomy step by step.